Reward charts are designed to encourage good behavior. In older children, tasks will usually be set such as carrying out specific chores each day. Once these tasks are completed, a sticker is placed onto the chart. After the child receives a certain number of stickers, they then receive a reward. However, reward charts for toddlers differ slightly. Unlike older children, toddlers don’t usually need to complete tasks such as chores. Instead, they receive stickers for specific behavior the parents are trying to encourage. The great thing about these charts is they can be personalized and tweaked to fit your own preferences. 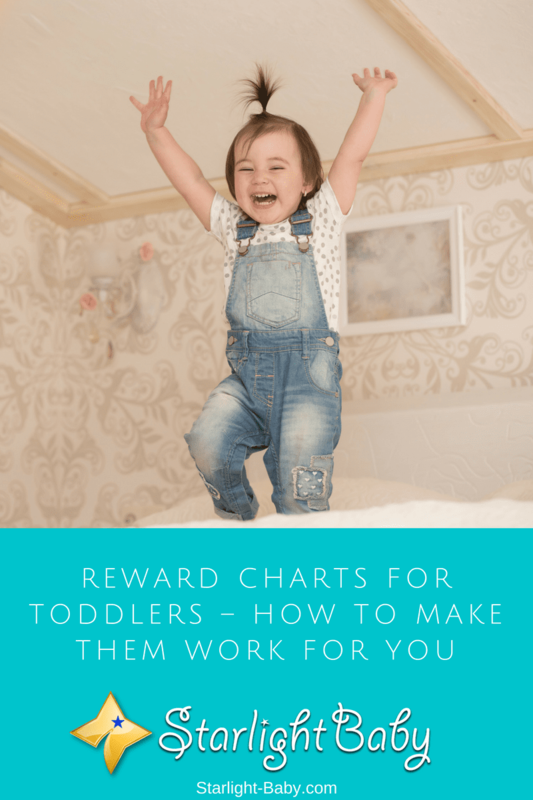 Can Toddlers Really Understand Reward Charts? The number one question parents have is whether a toddler can actually understand the concept of a reward chart. The truth is, if they’re under two and a half years old, it’s unlikely they will grasp the concept. Ideally, charts should be introduced at age three, but they can also work for two-and-a-half-year old’s, depending upon the child. The key is to make the chart easy to understand. You can also make the reward chart a fun experience to make your toddler more likely to pay attention to it. While you can use a reward chart to encourage all kinds of positive behaviors for older children, for toddlers you’ll want to keep them as simple as possible. You’ll want to avoid adding more than 10 steps/tasks, ideally sticking to around 5 steps. This way, your toddler won’t become too overwhelmed by the chart and they can focus on 1-2 steps at a time. Unlike older children, toddlers should also be given stars or stickers more frequently for smaller steps taken. For example, give them a sticker when they brush their teeth or put their own shoes on. This will help to keep them focused on the chart and the behaviors they should be following. Then, once they’ve reached the halfway point be sure to give them a small reward. Again, this helps to keep them focused and more likely to continue with the good behavior. One thing you should be aware of is the reward chart shouldn’t be overused. It also shouldn’t be used to try to encourage character-based behaviors. For example, using the chart to try to teach your toddler to be kind and more thoughtful isn’t a good idea. This is because these behaviors shouldn’t be reward-based. As they grow, they may stop doing nice things for others, or expect a reward if they do. A mistake you’ll want to avoid is to take away stickers or stars if your toddler is naughty. While you obviously don’t want to reward the bad behavior, you also shouldn’t disregard earlier good behavior either. If you start taking stars away, you toddler will lose interest in the chart entirely and potentially even start to really dislike the system. These are just some of the tips you can follow to try and make the reward system work for your toddler. However, it’s worth being aware of the potential disadvantages of using a reward chart to encourage good behavior. Although reward charts can work in the short-term, there’s very little evidence they can help in the long-term. In fact, there’s even been studies to show that the more people get rewarded for doing something, the less interest they start to have in the behavior which gained them praise in the first place. A specific disadvantage when using a reward chart for a toddler is they could simply be too young to understand it. If they don’t follow the chart, you could end up frustrated and angry, without realizing its actually just a little too difficult for them to achieve the tasks that you’ve set out at the moment. Many parents are also put off by the fact that they are giving stickers or rewards for things that shouldn’t really get a reward. Others also believe it to be manipulative. Then there’s the chance your toddler will think that if they’re getting a reward for doing something, it must be bad. So, they simply stop wanting to do it anyway. There’s also the possibility that once your toddler has filled up the chart and received the reward, they’ll go back to their bad behaviors. So, unless you want to potentially carry the chart on for the rest of their childhood, this is definitely something you need to consider. So, Is A Reward Chart System Worthwhile? As you can see above, there are a lot of potential downsides you need to be aware of with reward charts. They can be a great short-term tool to help correct bad behavior, especially in older children. However, they’re not really super-effective at helping to correct a toddler’s behavior. Of course, there are exceptions to this. Many parents have successfully managed to use the reward chart system to encourage positive behaviors in their toddler. However, it’s a case of trial and error. Each child is different, so the reward chart won’t work for everyone. Have you tried to use a reward chart with your toddler? How did you get on? Let us know in the comments! This looks like a good way to teach and mold a toodler’s behavior into something good in the shortest possible time, but it’s very important to not over use it because kids have a way they respond to things that are frequently used on them. I haven’t used this training pattern before but I’m definitely going to give it a trail. I didn’t use a Reward Chart when my kids were growing up. But I did give them rewards for good behavior, especially when they did well in school. And you’re right, it should not be overused because the child could get used to it and expect a reward for everything. Parents should be able to inculcate in the child’s mind that a good behavior should be constant and need not be rewarded from time to time. The truth is that I’ve not made use of the reward charts for any reason whatsoever and the thing is as a result of not yet being married. However, I could recall back in the days as kids when mom will always cook my favorite meal for me as a reward for doing the chores she assigned me to do. Also, there were rewards each time I do better at school in the sense that I get a new pairs of shoes or some nice outfits. So, it was really a great way that mom used to keep me on my toes back in my childhood days. So nice of you to remember those, Henrywrites. I guess we do tend to remember the good things about childhood. This is why it is important for parents to create loving memories for their kids that they could look back to when they become adults. Loving memories are quite necessary even for the fact that it is going to enable these adults, who were once kids, to look at the stage of parenthood as one of the best times to make their babies enjoy the best. This is the reason I always let the mothers know that the way they treat their kids now might contribute to the way such kids will react when they are adults. Yes, that is correct, Henrywrites. Everything a parent does to a child will have an impact in his/her adult life. It is, therefore, important to inculcate all that is good while the child is young. Making use of reward charts in bringing up one’s child to have a good behavior helps very well when it’s used effectively and efficiently. Kids appreciate rewards for what they have done even more than adults because they are still innocent down to their souls. Toys and gift rewards are good but a word of encouragement for doing good hold more strong immpression on the child. I totally agree with you, Emmaz, that rewards should be used “effectively and efficiently”. Rewards leave a lasting impression on kids. This is the very reason for the reward, for them to keep doing the good behavior because it makes parents happy and could earn them rewards until eventually, they get used to doing the good behavior. My child is still young to understand rewards. However, I have observed my sister kids and understand how rewards work. My sister will say, if you do this homework in 20 minutes, you can go to play. My nephew will hurriedly complete his home work. My sister says, if you clean your room, you can play playstation for one hour. My nephew cleans the room. My sister does not have a chart and her reward system is random. It’s wise for your sister to do that. No, she doesn’t have to have a chart to be able to give a reward. As parents, we get to know our kids well and know what could make them happy so we can base the rewards on that.